It may as well have been Turn Back the Clock Night at Chase Stadium this afternoon. 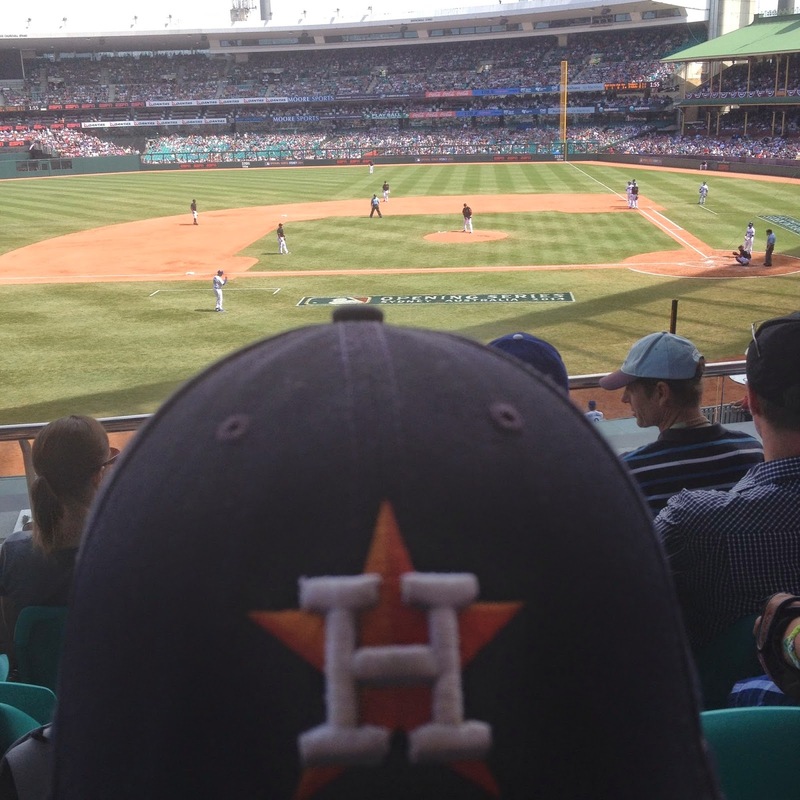 Sadly, the Astros only managed to Turn Back the Clock to April 2014. The Ugh-Stros were on display tonight - good starting pitching, TOOTBLANS, a lack of timely hitting, the bullpen losing the game again, and a leaky defence that managed to convert moderately-hard plays into base runners. Nothing happening tonight, and the Astros lose 4-1. The feel-good story of the night was Bradley J Peacock, who continued having himself a nice season as a starting pitcher (let's forget he was ever in the 'pen). He twirled six-innings of solid ball, giving up a meaty opposite-field home run to Paul Goldschmidt (into the Dodgers Party Pool 415ft from home plate) but that was all. He pitched around two flukey infield singles, giving up only three hits overall. He walked three (the 2, 3, 4 hitters once each, proving that discretion is sometimes the better part of valour) and stuck out 4. One double-play and one caught stealing (probably a busted hit-and-run) helped get outs, but all in all, it was a very solid outing. He is not close to being the fifth-best starter at the moment. The... uh... less of a feel good story of the Astros came from the 'pen. I may be being a little unfair, because they weren't awful. Josh Fields started the seventh, got to 1-2 on Martin Prado (the leadoff hitter for the inning), but couldn't get strike three past him. Interestingly, the radio guys commented that Prado seemed happy to foul of fastballs and wait for a mistake. Well, eventually caught up to one of the afore-mentioned fastballs on a 3-2 count, on the eleventh pitch of the at-bat, and hit a hard triple to right-centre which Dexter Fowler dived for. He sat on third with no outs for all of two pitches, before Aaron Hill hit a sac-fly to bring him home. It would be easy to beat up on Josh Fields here, but Prado's at bat was a very impressive bit of hitting. However, the Astros aren't quite as blameless for the rest of the inning. David Peralta made the second, uneventful out of the inning. Then CF Ender Inciarte grounded out to short, and Villar absolutely muffed a play of moderate difficulty. Man on first. Then Cody Ross - hitting below the Mendoza line this year and slugging less than .300 - hits a double to the right-centre gap which Dexter again muffs on the pickup (error), but I imagine that Inciarte would have scored regardless. Inciarte is fast, Ross ended up on second. Geraldo Parra was put on with an IBB with two outs to preserve the force-out and get the platoon matchup, with the Astros opting to pitch to Chris Owings. But both runners advance when Castro gets crossed up; Fields throwing a fastball, and Castro expecting curve. Owings later grounded out for the last out of the inning so no further damage was done, but this was messy stuff, and reminded me too much of April. Ugh. pr0FF3ss0r_F4rnsw0rth started the eighth, giving up a double to that Paul Goldschmidt guy again. Goldschmidt then stole third - F4rnsw0rth was super-slow to the plate and the batter didn't help Castro's attempted throw down to third any, but he would have scored anyhow because Aaron Hill bloop-doubled off the end of the bat to RF, past a diving Presley who was trying to make the catch to keep Goldschmidt at third. Right... now I get to talk about the TOOTBLANS. Excellent!! The Astros had two on with two outs in the first, on a single and error and they didn't score. They had two on with no outs in the second, then first-and-third with one out and the pitcher up (but Bo had him bunt and it went foul), then bases loaded with two outs, and they didn't score. They had the leadoff man on in the third, but he (Singleton) was erased on a caught stealing on a 2-2 count that was probably a busted hit-and-run. They didn't score. In the fourth and fifth, they mercifully went in order to allow me to stop bashing my head on the coffee table. A hard leadoff double from "Singles" in the sixth put a runner in scoring position with no outs. Castro grounded him to third. Dominguez singled past a drawn-in infield for the game tying RBI. In the seventh, the Astros again got the leadoff runner on with a single, but he was erased on a fielder's choice, with Villar hustling down the line to avoid the DP. Then, either a TOOTBLAN or a busted hit-and-run - Villar ran for second on a 3-2 count, the pinch-hitter Guzman stared at it, Villar's jump was horrible, and he got caught in a run-down. They. Didn't. Score. A Dexter Fowler lead-off single started the ninth. Altuve erased him on a DP. They didn't score. And, again mercifully, they went quietly in the ninth. Jon Singleton had a standout day (3-4, 2B, R), and Alex Presley had two hits (2-3). Dexter went 1-3 with a BB to continue his otherworldly ability to get on base. His OBP stands at .399. Other than that - two GIDP's, 2 CS. Ugh. With the score tied 1-1, Martin Prado battled Josh Fields for 11 pitches, eventually tripling to right-centre. His slide into third was just for show - he could have moonwalked in there. It was a wonderful piece of hitting, and sometimes you just have to tip your cap. It was clearly the turning point, because the Astros fell apart after that. Brad Peacock and Jon Singleton get to share this one. Peacock continues his >5IP, <4R conceded streak on his starts in 2014. "Singles" gets three hits, including a hard line double off the base of the wall in right. He is also surprisingly fast. I hate to say it, but Villar. 0-3, 10 pitches, error, caught stealing. This will be the "concentration difficulties" that everyone was talking about in the Minors. Yuck. Lets watch the barely-believeable Dallas Keuchal (7-3, 2.50) versus Brandon McCarthy (1-8, 5.13) at MMP tomorrow. 8 Eastern, 7 Central. Great review of the game....but all the ughs ? And a yuck......please refrain from those for the rest of your natural life. I'm sure others will appreciate!